I live just across The Rug Company store in Mexico City. Last night I was walking my dog Rita when I saw this needlepoint wallhanging on the window and I absolutely loved the slavishly mix and match of colour and patterns. 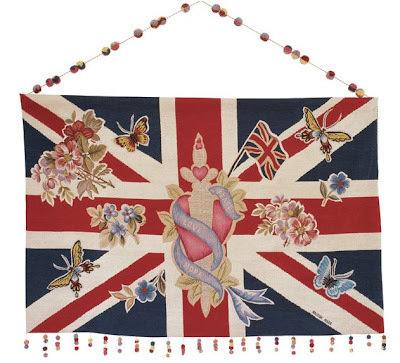 Its called Jubilee and its designed by Lucinda Chambers, fashion director of Vogue. 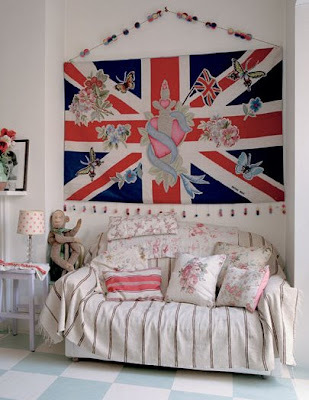 Then I found this picture, it looks amazing in the room with all those cottagy romantic fabrics and then the Union Jack flag wich just makes it a total fashion statement.